The collaborative centre model was designed to create a national approach to complementary medicine research. The centres fostered research excellence, created cross-institutional partnerships and links with industry and clinicians and strengthened the depth of complementary medicine research capabilities in Australia. Emphasis was placed on areas of high disease burden, demonstrating safety, efficacy and cost effectiveness, and methodological issues relevant to the specific nature of complementary medicine research. 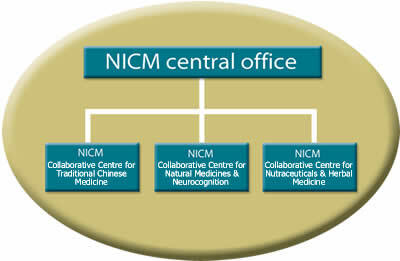 The three successful NICM Collaborative Centres announced in 2008 were established through a two stage process, beginning with a call for expressions of interest with feedback. This first stage was followed by invitations to lodge full applications that were considered by an independent expert committee supported by external peer review. The focus for funding in the inaugural grants round followed national stakeholder forums and a set of broad research priorities. Research that has the potential to impact positively on the health and wellbeing of all Australians. Rather than simply align research to national health priorities, emphasis will be given to those areas of high burden of disease where preliminary evidence is strong and demonstrates likelihood of positive impact. Preliminary data reviews may be required to assist this process. Research that investigates safety, efficacy and cost effectiveness of complementary medicine and translates this into policy and practice. Safety, efficacy and cost effectiveness studies with outcomes relevant to policy and practice help close the loop between research and its implementation. Research that investigates methodological issues relevant to the specific nature of complementary medicine. This includes the development of methodological tools such as measurement instruments, trial designs and pharmacological approaches which may impact on our understanding of the whole practice, concepts and mechanisms underpinning complementary medicine. There was a high level of competition for the limited funding available - $1.8M, against a total funding request of $6.25M. The three successful recipients of the NICM Collaborative Centre grants generated a further $6.08M in additional leveraged funds (cash and in-kind) committed by universities and other collaborative partners.